Why Choose Baltimore Wood Nature Center for Your Next Birthday Party? Do you have someone in your life that loves to play outside? 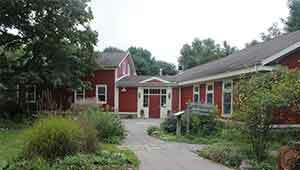 Then Baltimore Woods Nature Center is the perfect place for your next birthday party! Our team of Environmental Educators offer unique interactive nature themed birthday parties for our members ages 3 to 12. We have a wide range of themes for our parties from snowshoeing to frog catching. The highly imaginative mind of the child is used as a stepping stone to the investigation of the living and non-living world of a woodland forest. Party goers will build fairy houses in an effort to attract the fairies that inhabit The Woods. Explore the amazing world of trees. How do trees survive during the different seasons here in Central New York? Through a take home art project, discover the diversity and beauty of leaves. explore the world of ice crystals. Enjoy the wonders of the “bug” world. fields and forests here at Baltimore Woods. cycle, from eggs to tadpole to frog! Learn the characteristics that make a salamander an amphibian and not a reptile. Hike through the woods and see how many salamanders you and your friends can find hiding under logs and rocks. Discover how to read the stories animals leave behind. story’s setting, characters, and plot. On a guided hike through the woods, party goers will look for these in the snow or mud! Have you ever noticed how well engineered a beaver’s dam is? On a walk through the woods to Peanut Hill, party goers will observe structures created by nature’s architects. At Peanut Hill they will create their own structures made out of natural materials. Thousands of years ago a glacial lake sat right where Baltimore Woods is located today.This glacial lake left large clay deposits exposed along Baltimore Brook’s banks. Come discover these clay deposits and create sculptures adorned with natural objects. What does a party consist of? Unfortunately Baltimore Woods does not host birthday party programs on the 2nd Saturday of the month from September to May due to the Winter Farmers Market or on Sundays as the organization is closed. Cost: $150 for members; $175 for non-members. A $50 deposit is due upon receipt of your birthday party registration. If you decide to cancel your birthday party, you must do so two weeks in advance of the party date or you will be charged a $50 cancellation fee. In the case of questionable weather, Baltimore Woods will determine if the party should be cancelled and we will do our best to reschedule in a timely manner. Special Notes: The Leaf Art and Snow Flake program have an additional material fee per participant. We encourage decorations for our birthday parties but please no helium balloons or piñatas. Email Becky Wilson, Education Manager becky@baltimorewoods.org who will then be in touch.